Gratitude (n); The quality of feeling grateful. We think that there is a lot to feel good about – family, friends, food, fun, and, oh yes, wine. While shopping recently, we came across a Gratitude Jar. It’s such a simple concept – a jar and a box of folded cards imprinted with the word Gratitude – but with such huge implications. The jar now sits on the fireplace mantle at the inn. 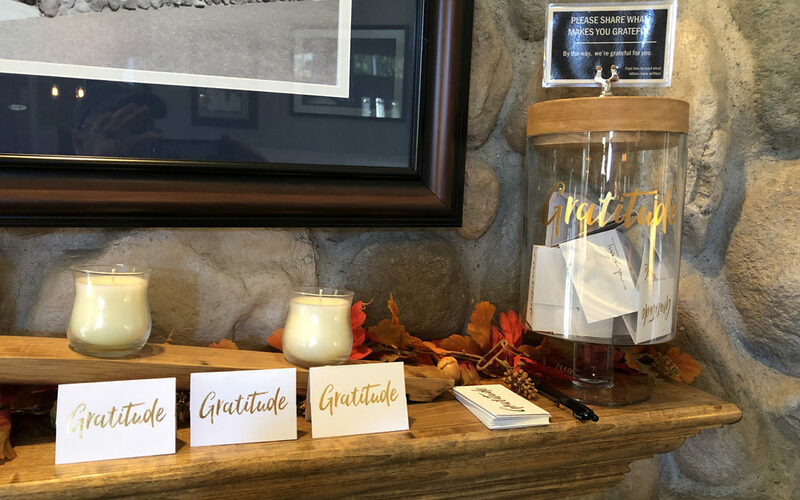 We invite our guests to fill out a card with what makes them grateful, inspired, or fulfilled, and to place their card in the jar for everyone to read. We call these card ‘Gratitudes‘ and we find them so completely uplifting that we can’t wait to share them with you. Here are just some of the recent Gratitudes that have moved us. We hope you’ll be inspired as well. The support of my tribe – D, Trish, JRB, Lindz, Fred, Vince, Molls, & Missy. So grateful just to be here. Words cannot express what a treat this is. My life, my husband, my kids, friends, & opportunities. Yes! The patience others show me when mine slips away for a moment. Spending my Wednesday with my wife and her great friend on a rainy day. My wife Tracy. Everything I am and have in my life begins and ends with her. Kind gestures. I want to reciprocate because this circle of kindness makes our world better. Sam’s selflessness . . . & coffee. Having discovered that life is great everyday. My family . . . & a night away from them!